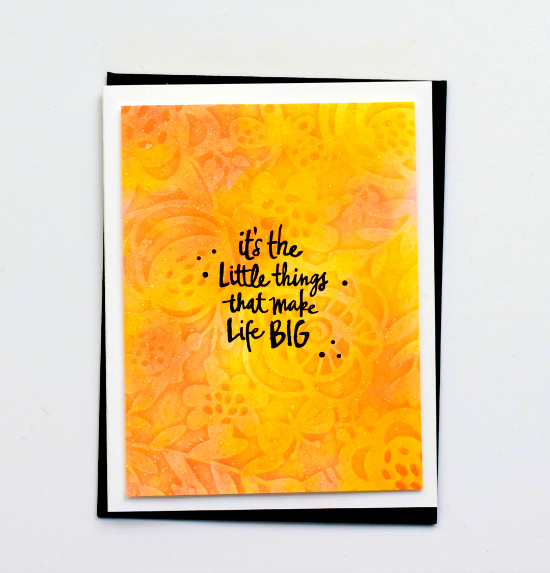 Put a Hero Arts Bold Floral stencil through my Big Shot with an embossing mat and dry embossed. Came out great, so -- of course -- now I want more $tencil$. Blended Distress Oxide inks onto the card (Wild Honey and Abandoned Coral). Using softer colors and a different sentiment and this could make a nice sympathy card. Stamped a sweet sentiment from Reverse Confetti Posted Notes (which does not appear to be available any more), and added a few black Nuvo drops. Trimmed and popped up on a white card. MOOD WHEN DONE: Been spending a lot of time crafting, which is always a good thing. My husband is running around organizing and decluttering our house but he's banned from my craft room so, so far, we remain married! This is so beautiful -- the pattern, the glowing color, the black sentiment popping. Wow! Yes, need more $stencil$. Isn't that the way it goes? This card says 'happy' with the beautiful colors! I have never thought to try embossing with stencils, but definitely going to give it a go! Thanks for sharing! Beautiful colour and texture...and the black sentiment looks super on it. I'm glad to hear the technique worked for you! I never had any problems with it, but when I featured it once as a TLC challenge, I had people saying it smashed their stencils, and even worse I think someone said it broke their Cuttlebug. Yikes!! And it's such a great look, too.